Conquest Harlanate punched her ticket to the Breeders’ Cup with a gutsy score over the favored Isabella Sings in Saturday’s Grade 2, $228,800 Natalma Stakes at Woodbine. Conquest Harlanate (No. 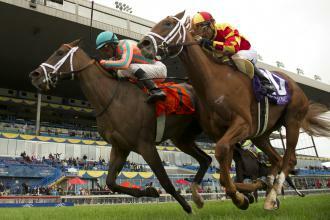 7) beats Isabella Sings by a neck in the Natalma Stakes on Saturday. Green Doctor and Appeal to the Win fought for the lead through the turn in the one-mile turf route for 2-year-old fillies, as Conquest Harlanate raced in midpack under Patrick Husbands. Conquest Harlanate mounted a wide rally exiting the turn and then wore down Isabella Sings in the final furlong to prevail by a neck in 1:40.61 over a course labeled “good.” Skinner Box finished another two lengths back in third in the 12-horse field. Second choice Don’t Leave Me was a non-threatening sixth after missing the break.